My stay in Bangladesh is already half over. This trip is flying by. Today is the first day I took some photos. I’m sorry to say, that half of them are of an effluent treatment plant at a textile factory and the other half were taken out of a car window on a rainy day (also today). Hopefully they are interesting anyway! 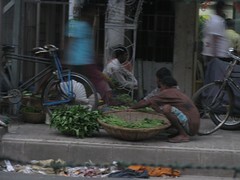 This is my second visit to Dhaka. I must admit, I was not as excited this time around. Although this is partially the result of the timing (Dave and I did just get married less than 3 weeks ago! ), part of it is the fact that I’ve been here before and know what to expect, which makes it a little less of an adventure. It is also the reason why I have not yet taken a single photo on this trip, but I will I promise! Hello Folks! 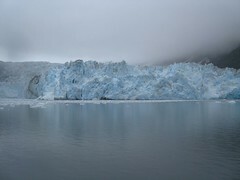 I haven't written much in a while, mostly because I haven't travelled since Alaska in July. But also because Dave and I got married at the beginning of the month! There are a few photos on flickr. Now that the wedding is over, I am back in Dhaka for work. I arrived early this morning, after leaving late Thurs night. Journey was good. The only interesting bit was that I flew into the new T5 in Heathrow. But I didn't see much of it because I then had to transfer to T4 to spend my waiting time. I did experience a lot of escalators. Today is the weekend, and tomorrow the fun begins. After I get home from this trip, Dave and I leave for our honeymoon in Cuba! Which I am really looking forward to. More to come soon! Today I had no plans, so I decided to go be a tourist. Just like everyone else around here! 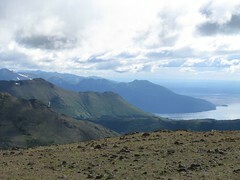 Anchorage is abuzz with summer tourists, and you can generally spot them a mile away. I’ve seen a few sights already, so today I drove out to the Alaska Native Heritage Centre, and then to Earthquake Park. The Sun Came Out in Anchorage! And it was glorious! You may be thinking to yourself that is a bit of a strong sentiment for a little bit of sunshine, but this is about the second time I have see blue sky since I arrived, nearly two weeks ago. The newspaper has had two articles on the summer weather since I’ve been here. The first said that this summer has been cooler than average. 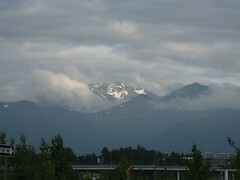 The second said that July in Anchorage has seen record rainfall. There has been an inch of rain here this month, which is apparently high. I can tell you that it’s been raining off and on since I got here though. I lived through the rainiest July ever in Anchorage! It’s definitely going down in history books. I’m not sure what I expected of Alaska. A great white baron North I suppose. It’s a place I’ve never really thought about; it’s always just kind of been there, on the map. I had never thought about coming to Alaska, and as a result never put much thought into what it’s like here. Well, I am discovering that it is not a great white baron North, and far from it! 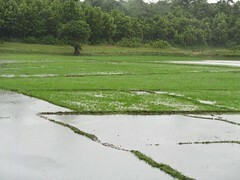 In fact, it is very green at this time of year. The lilacs and the daisies are both in bloom (as a result of the short but accelerated growing season), the trees are green and the vegetation is really very lush. I have been in Anchorage for 3 days now, and have spent a lot of that time working. That’s what happens on business trips! 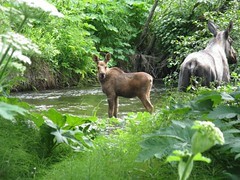 I am hoping that this weekend I will get a chance to see some sights, at least in Anchorage. There is so much to see and do here, it’s incredible. Alaska is an adventure-tourist paradise (especially if you are into fishing). I’ve posted a few photos, but I haven’t really had a chance to take many yet. There will be more to come! Hey Folks! It's been a while since I've written a post, but then it's been a while since I've been anywhere other than Ontario! My last trip was slightly more exotic, but this one will also be interesting. 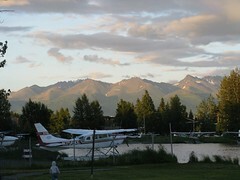 I'm off to Anchorage, Alaska on Monday afternoon, where I will stay for 2.5 weeks. This is supposedly the best time of year to go to Alaska, and I hope to make the best of it! I will have two weekends, and two extra days at the end to see a bit of Alaska...as long as I haven't got work to do on the weekends!